Busch Gardens Christmas Town is offering 10 select days for $20 or less. As expected, ticket prices have been increasing. However, Busch Gardens has blocked off 10 days that you can still pay less than $20 per ticket to enter the park – three of those days are at the low price os $16! Don’t miss out on your chance to save! Click HERE to purchase tickets – you MUST purchase online in advance! These prices are not available at the park. If you purchase at the park – the price will be $38!! This is still the best offer we have seen for 2016. Not sure it’s worth a visit? Read my article on – Is Christmas Town Worth the Cost? Busch Gardens Williamsburg will have a sale on Christmas Town tickets ONLINE ONLY starting today, November 13th for a limited time! The price for the single-day admission “Twinkle Ticket” will be $14. You may purchase up to 6 tickets. Please note there is a $5.99 service fee, but it’s still an awesome deal! I doubt we will see a better single-day offer this season. The tickets can only be used one of these select days: Nov. 29; Dec. 4, 6, 11, 14, 15, 16, 17, 21, 24, 30, 31, 2015; Jan. 1 and 3, 2016. The ticket doesn’t include the parking fee. If you have a season’s pass you can use it for parking during Christmas Town. If you were considering a Season’s Pass for next year, you can purchase it now (it’s valid for 12 months) and a Twinkle Town ticket then take advantage of the free parking and food discount now, plus have the pass to use all next season as well. 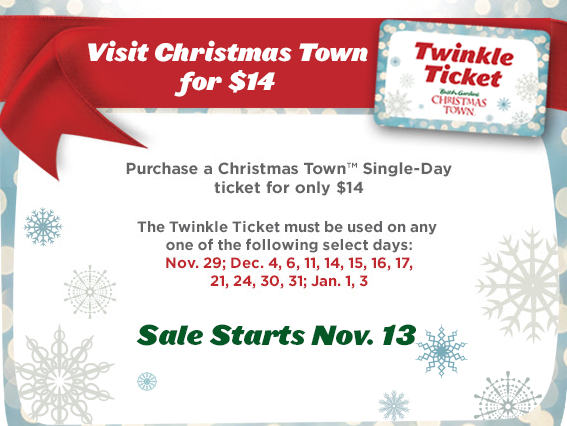 The Twinkle Ticket is available online only Nov. 13 beginning at 12:01 a.m. – Nov. 17, 2015 at 11:59 p.m. $14 ticket may only be used on any one of these select days: Nov. 29; Dec. 4, 6, 11, 14, 15, 16, 17, 21, 24, 30, 31, 2015; Jan. 1 and 3, 2016. Valid only at Busch Gardens Williamsburg. Does not include parking. May purchase up to six discounted tickets. Cannot be used in conjunction with any other offer. Some restrictions apply. Additional taxes and fees apply. Christmas Town is a separate-ticketed event, not included with Pass Membership or Waves of Honor™. Event dates, times and inclusions are subject to change and/or cancellation without notice. Operating schedule, rides/attractions and prices are subject to change without notice. See website for complete details. Purchase tickets HERE starting the 13th. 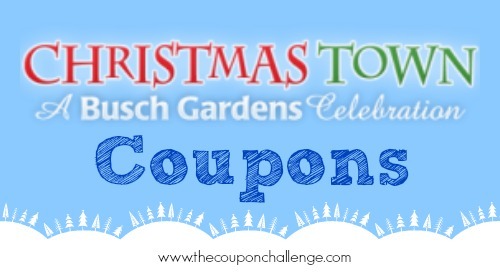 See all the other Busch Gardens Christmas Town Coupons 2015 for current deals and prices. Christmas Town fun card holders can purchase up to 6 one day passes to Christmas town for 50% off and tickets can be used Dec 13-20 and December 22-24. Coupon must be presented at time of purchase. Tickets must be purchased at ticket window and not online. **All the information for this offer is in the email received by Christmas Town fun card holders. The ticket offer is buy three tickets, get one free! This brings the price of the tickets from $30 to $22.50 when you buy four (25% savings). The offer can be purchased online only at www.christmastown.com/va starting Friday, Dec. 13. You can not purchase this price at the park, you must order them in advance! If you want to get a Flex Ticket you can use the codes in the image above to save. Purchase tickets online. 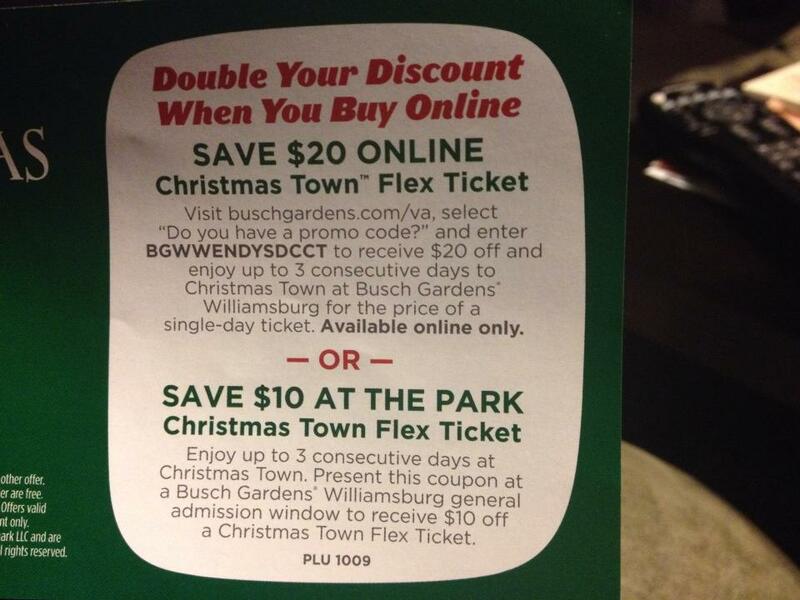 The official Busch Gardens Williamsburg Christmas Town ticket price for 2013 is $30 – a $3 increase from last year. If you are an annual pass member, you can get unlimited access to Christmas Town for $30. That would make the annual pass $150 total and still includes the FREE parking and other pass member perks. Additionally, Busch Gardens will offer a Christmas Town Fun Card for $30 giving you the same unlimited access to Christmas Town as a Fun Card does during the normal operating season. You pay for a single-day visit and return an unlimited number of times during the holiday season. In past years, Busch Gardens has offered deeply discounted tickets through announcements on Twitter. Such offers will not be available this year, spokesman Kevin Crossett says. Although Twitter is out again this year, I would expect to see some Collective Buying sites such as from Groupon and Living Social offering single-day or multi-day admission again this year. Use THIS LINK to purchase your Christmas Town Fun Card. $5 off Christmas Town coupons are available at Papa John’s Pizza, Farm Fresh & Chick-fil-A. $10 off a flex-ticket option is coming to Wendy’s in the Maryland and DC area. In an effort to help you save on Busch Garden’s Christmas Town tickets, I have created a separate email blast form. You can click HERE to sign up. You will know important Christmas Town savings as soon as I post. 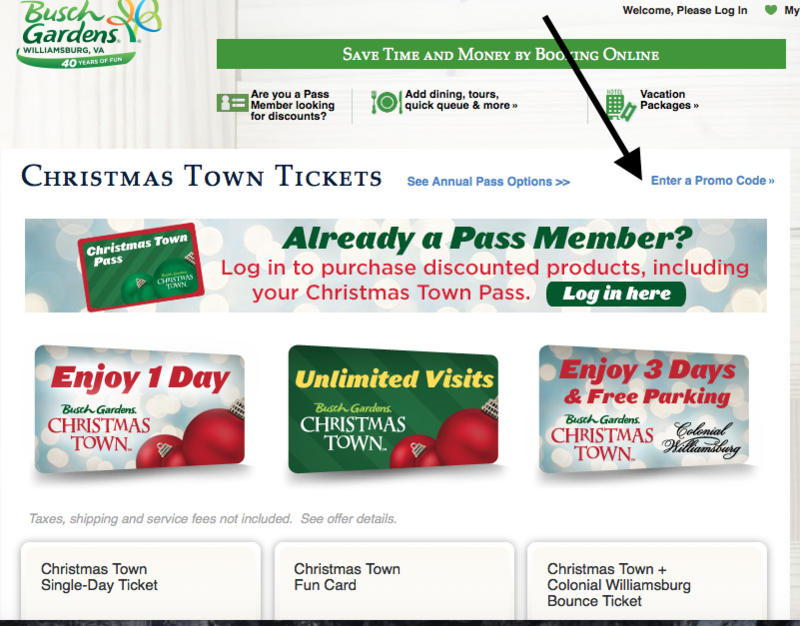 In an effort to help you save on Busch Garden’s Christmas Town tickets, I have created a separate email blast form. You can sign up in the box below or click HERE. Once I publish a new Christmas Town ticket deal, you will get an email. Why? Some tickets only have limited quantities available and you don’t want to miss the offer! Please note that this is only for getting notification of deals for Busch Garden’s Christmas Town. IF you want daily deals, please request daily deal emails here.